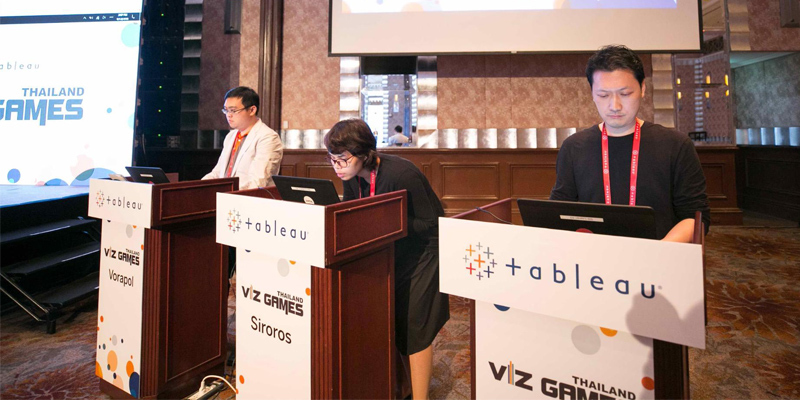 This year we hosted the first ever Viz Games Thailand 2018 at Tableau Experience Thailand! Our three finalists went head-to-head on stage, creating vizzes LIVE within 20 minutes using data from the Energy Policy and Planning Office of Thailand. Thanks to all of our sensational contestants: Vorapol Santhadkolkarn, Chatchai Chattirak, and Siroros Roongdonsai. Congratulations to our winner, Vorapol Santhadkolkarn! Check out the vizzes they created below. Ever wonder what competitive vizzing is really like? We last heard from Tristan, Jacob and Joshua—three contestants who shared their experience competing for eternal dataviz glory at IronViz 2017. Now, here are contestants Siroros and Chatchai to tell us all about competing in Viz Games Thailand 2018. What did you think when you first received the dataset? Siroros: When I first received the dataset, I was quite surprised! I even said, "Oh my god... it is about Fuel Prices.” To be frank, I have no idea about the difference between fuel types because I do not drive. So, I was curious about some information like: Why is Thailand the only country using E10? What makes E10 popular in Thailand, and not in countries? Thus, I had to research more. I started asking more questions like do Thai People really pay more expensive fuel prices? And, do rich countries always pay cheaper fuel prices? Chatchai: I knew that the dataset was really important and would change how I’d make my dashboard in the limited time on stage. If the data was complex, I would have to spend time to prepare my own dataset (by transforming and cleaning the original dataset). However, after I received the dataset, I was found that the dataset was simple and it only needed a little bit of cleaning. And even though we were allowed to use other data sources, I was afraid I wouldn’t finish my viz on time. So I used only one dataset. What was it like on stage? Siroros: On the day of the event, I was so excited! I was so excited that I actually had my first meal of the day at 6 pm! I arrived very early to prepare myself. I also participated on-stage at another event at Tableau Experience Thailand. It was a really wonderful experience, and an all-around memorable day. Chatchai: Before getting in to the stage, I felt relaxed. I came to the event in the morning, so I got used to the large auditorium and many attendees. I also chatted with the other two competitors, which helped me feel more comfortable. On stage, I felt just a little bit nervous because all of audience members were watching us while we created our vizzes. But, it was more fun and exciting than nerve-wracking! Tell us about what you created! Favorite parts? Things you would change? Siroros: Due to only 24 countries being in the data, I decided to present the data as a custom circle map. I think it is clear and easy to compare and see the differences of each country. This is why I decided not to use a world map to present the data. 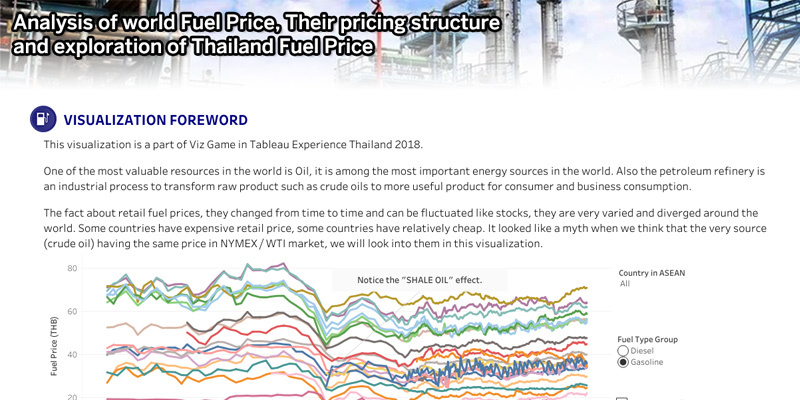 In addition, I wanted to compare the fuel price in Thailand with other countries by using the line charts, using Thailand as baseline to see whether fuel prices in Thailand are more expensive or cheaper than in other countries. However, it is sometimes hard to see many lines in the same chart. I used the highlight features to make the viewers easier to see. But if I could change something about my visualization, it would be to not duplicate these line charts. Less items on a dashboard can be easier to manage and for the audience to interpret. 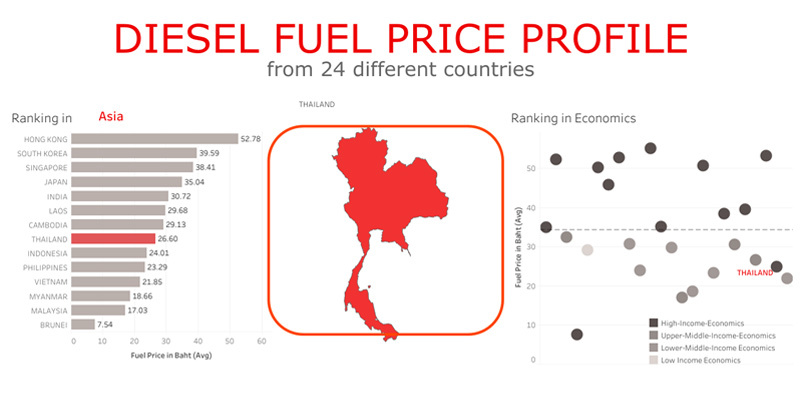 Chatchai: To compare fuel prices with other countries in the same regions, I used a bar chart and highlighted red color for the country that we selected from the filter. Bar charts are really simple, which helps everyone to understand them. 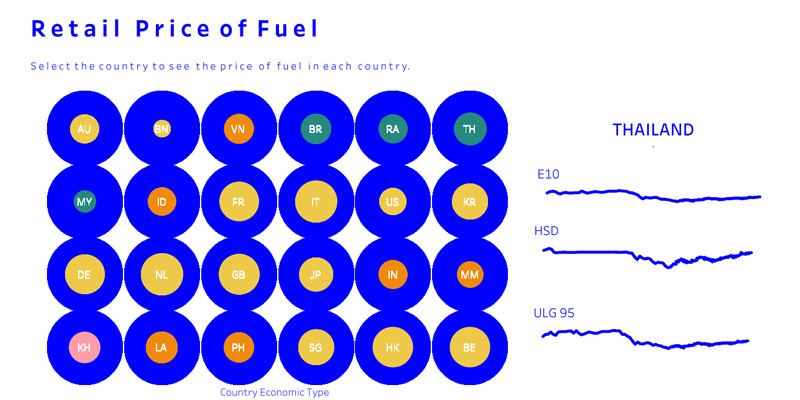 I also decided to use a dot chart, but to compare fuel price with all 24 countries. This made it clear where the selected country's fuel price is out of all the countries. I also used the shape of selected countries to help imply that the charts in the dashboard are filtered for the selected country. My favorite chart in this dashboard was the one about whether the price increased, decreased, or stayed the same in the last two years. I think it's really easy to understand at first glance! Any advice you would share with those wanting to participate in future competitions? Siroros: Just come and join! There’s nothing to be worried about, and it is really fun! Chatchai: Three key words to make interesting dashboards are “insight,” “tell,” and “beauty.” You want to uncover an insight in the data, tell that insight to audience, and make the dashboard beautiful to appeal to the audience. While accuracy of data might be more important than beaut, if you can’t make the dashboard appeal to your audience then they won’t be able to see your insights at first glance! Click image to view viz in full. See what you can create using the dataset from Viz Games Thailand 2018! Download it here. Thanks again to all of our contestants!